The use of external storage and the benefits of virtualization became a topic of discussion in the IBM® i area during the last several years. The question tends to be, what are the advantages of the use of external storage that is attached to an IBM i environment as opposed to the use of internal storage. The use of IBM PowerVM® virtualization technology to virtualize Power server processors and memory also became common in IBM i environments. However, virtualized access to external storage and network resources by using a VIO server is still not widely used. 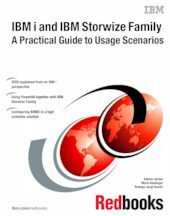 This IBM Redbooks® publication gives a broad overview of the IBM Storwize® family products and their features and functions. It describes the setup that is required on the storage side and describes and positions the different options for attaching IBM Storwize family products to an IBM i environment. Basic setup and configuration of a VIO server specifically for the needs of an IBM i environment is also described. In addition, different configuration options for a combined setup of IBM PowerHA® SystemMirror® for i and the Storwize family products are described and positioned against each other. Detailed examples are provided for the setup process that is required for these environments. The information that is provided in this book is useful for clients, IBM Business Partners, and IBM service professionals who need to understand how to install and configure their IBM i environment with attachment to the Storwize family products.